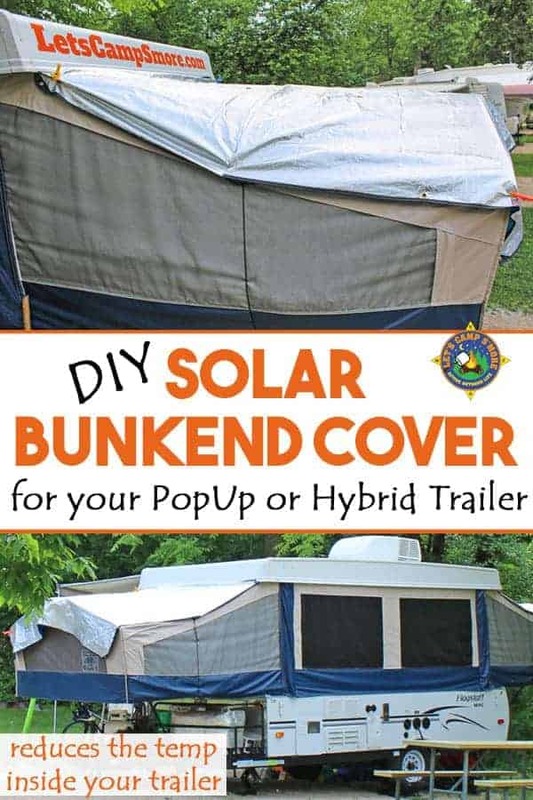 DIY Solar Bunkend Covers will reduce the temperature inside your PopUp Camper or Hybrid Trailer. 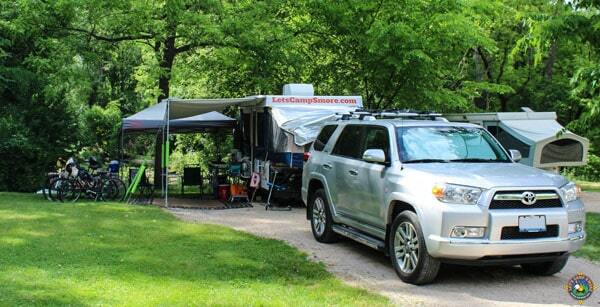 Do you love to go camping in your popup trailer, but the temperature gets too high in the middle of the summer? 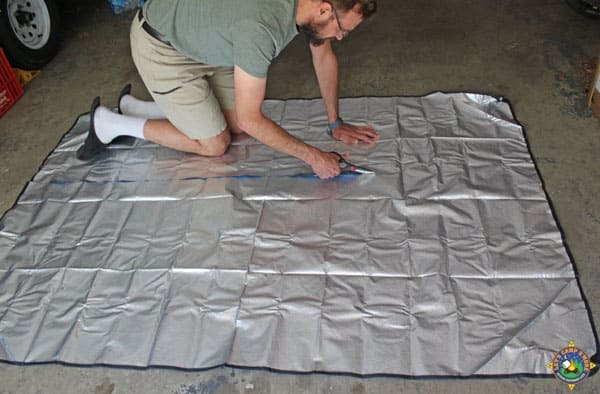 Make yourself these Solar Bunkend Covers to reflect the heat so you can camp all summer long! 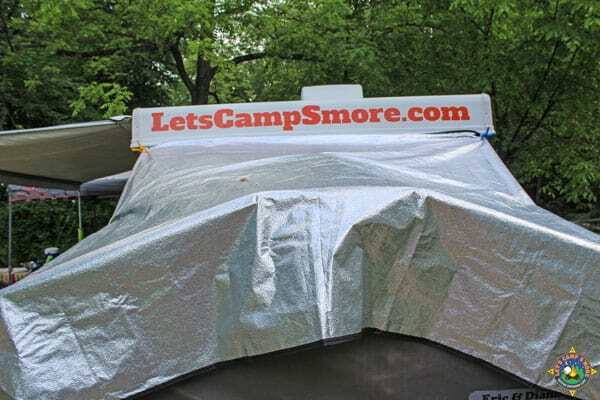 If you hang out in any popup camper circles, a common question is How do I keep my popup cool in the summer? Several people have suggested the use of PopUp Gizmos. 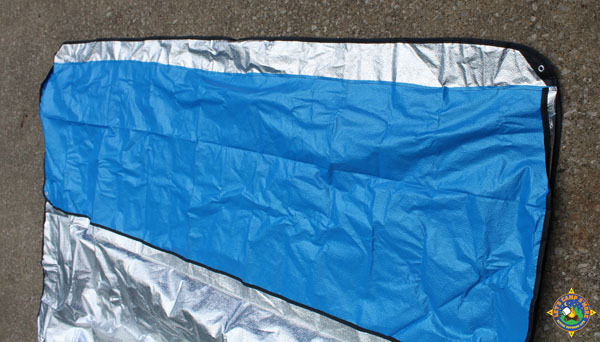 These awesome covers are put over the ends of a popup to help keep them cooler in the sun. We love the idea and decided to make our own, which saved us over $100 for a set. If you are not handy or crafty, then go ahead and order some. Start by measuring the top of your bunk ends. Our pop-up trailer has a queen on one end and a king on the other. The queen is 84″ x 64″ and the king is 84″ x 74″. Since each solar blanket is 84″ x 60″, we use three blankets. We cut one blanket across to create an 84″ x 25″ piece and an 84″ x 35″ piece. We could have cut them into smaller pieces but decided to use all of the blanket. With solar sides together, stitch a cut piece to a whole blanket. Diana stitched the piece in place about 5″ up from the edge as not to stitch over the grommet corners that are already in place. Repeat the stitching for the other blanket. This is what the stitched blanket cover looks like when stitched in place. By no means perfectly straight, but it makes no difference. Add grommets to the side of the cover. 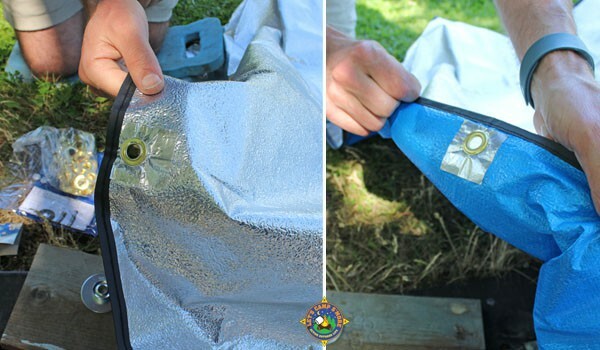 Use foil or duct tape underneath the grommet for reinforcement. We had foil tape leftover from this project. This is what the new grommets look like. Attach pieces of paracord to the grommets. We used bungee cords underneath our bunkends and measured the length of paracord accordingly. 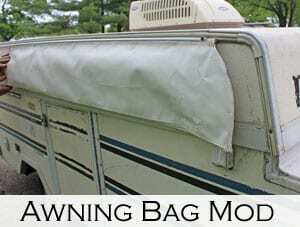 Optional: Attach Velcro to secure the cover to the roof of the trailer. Diana sewed the softer side of the velcro to the top of the cover. We stuck the adhesive velcro to the underside of the lip of the front and back of the trailer roof. Just raise the roof a few inches and put the cover in place before raising it the rest of the way. In addition to the cord, you can use clips to secure the cover in place. We have not used ours in really windy conditions yet, so we’ve only used a few clips and cord. You can see that the end of our cover is a bit loose. We plan on making some adjustments to that loose end this season. We will update the photos here when we do. This solar bunkend cover really makes a big difference in the heat. 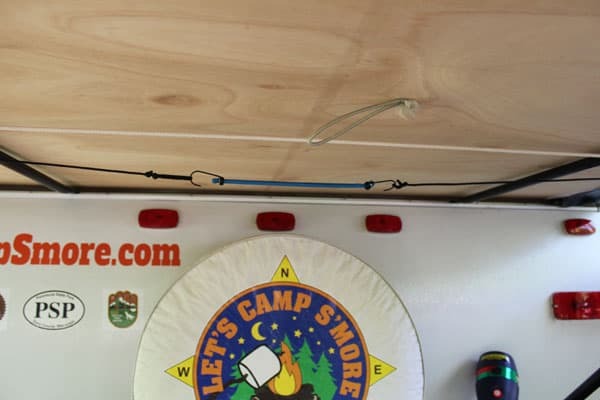 If we are on a trip where we are moving from campground to campground, we unclip it but leave it velcroed in place and fold it in with the bunkend. 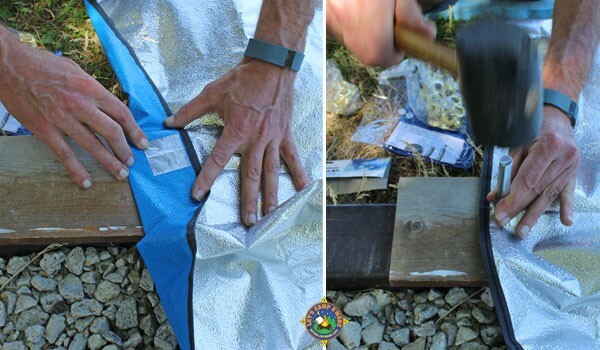 Turn the cover over with the silver side down to hold the heat in during cold temperatures. Share the photos of your homemade cover at Pinterest or on Facebook. 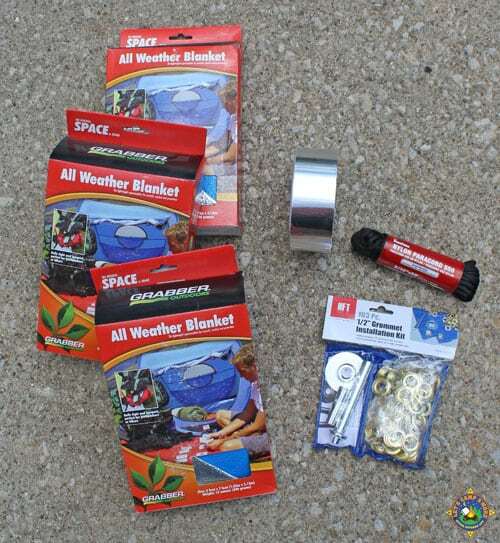 What a smart idea for controlling the temp in your camper – you guys always have the best camping hacks! This is a great idea. We had a hybrid camper at one point and it would get SCORCHING in those bunks. Yes! It can sure get hot in the sun. This is such a cool idea! We don’t plan on using a pop-up, but we might end up with a hybrid so this is great! I will definitely be bookmarking this for future references! We had a popup when I was a kid and I remember it being SOO hot. What a great idea.